Today the realisation hit me – it is just over a month left until Christmas and I haven’t produced any holiday related content on my blog, let alone done any real life Christmas preparation. So I decided to start with all important choice of holiday outfits for ourselves, since we all know that is what we are all secretly looking forward to the most: our holiday wardrobe! Since I only have one month left and a whole bunch of Christmas related decisions to make I am doing this one the easy way. You can shop around for hours going from store to store to choose a dress, but sometimes you do not have to sacrifice the selection while shopping under one roof from great pre-selected range, cutting all the time wasting out. This is what I did today – I headed to department store House of Fraser which surprised me with the selection: there are literally thousands of dresses! And another time saving technique (otherwise I still could have been there for days) is to decide exactly the type of dress you want for this special occasion, and the only way to do it, is to seek your inspiration before you head to the shops. 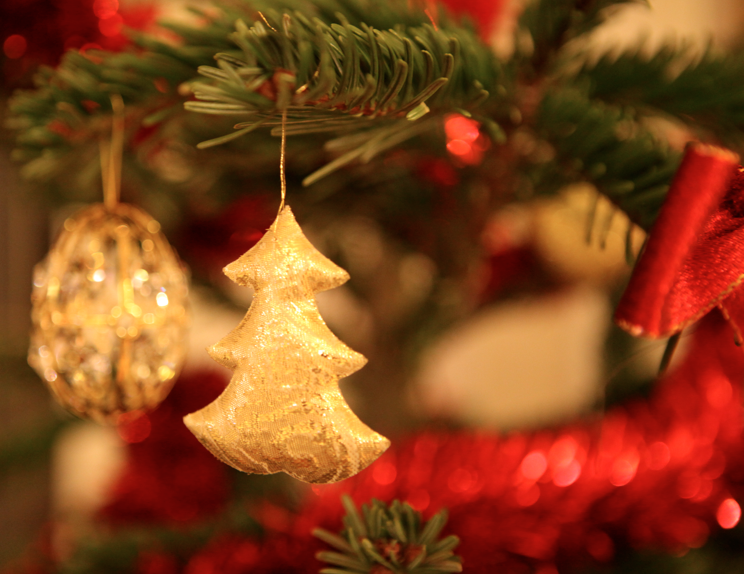 My inspiration came from flicking through last year’s Christmas pictures – I once again fell in love with my family’s Christmas tree that was beautifully decorated in red and gold palette. And since red and gold also go perfectly with this holiday season, those are the hues I chose for my outfits. Since I also know that I am having a few Christmas parties and a few are going to be formal I am opting for full length gowns (haven’t had a reason to wear one for so long yet desperately want to). Thus I entered House of Fraser with clear image of what I want and surprisingly was still spoiled with choice! Here are my favourite styles that are also available online. So if you haven’t already, use this for inspiration, or pick your colour and style and set off to find your perfect Christmas dress! Merry Christmas to you all! Let this holiday remind you of the importance of family, fun and laughter. Have a great day and amazing last week of 2011! I would like to take this opportunity to mention that My Fashion Wish List has been having amazing four months and it is all thanks to you, dear readers! Last week my post on rolled up jeans has been features in top 20 fashion blog post of the week on Independent Fashion Bloggers website and I am so proud! Here is the IFB weekly round up, you might like to see other posts in top 20 by great bloggers in the community! Also My Fashion Wish List recently won a blogging competition with Style Mogul – her blog post on me and my blog is going up soon! 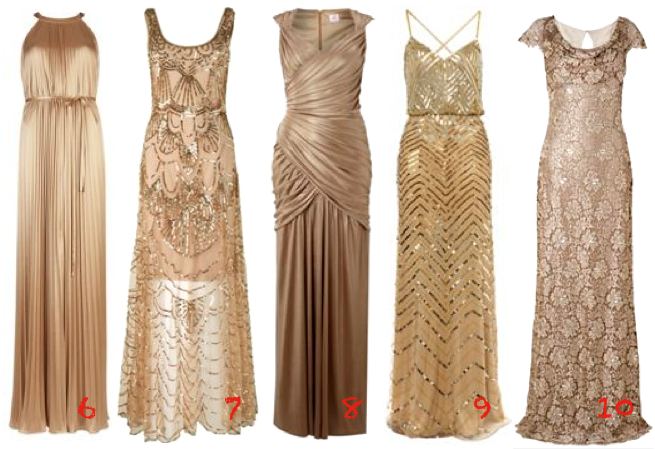 Christmas is 22 days away and if you have not picked you dress yet, it is time to hit the shops! I must admit more that one item from my holiday wardrobe over the last three years came from French Connection. There is something about their dress collection that ticks all the right boxes: highest quality, feminine shapes, beautiful colours and tons of sequins! The range this year is as always impressive – if you do not find at least one dress that you feel like you must add to your wardrobe I envy you and your self control. Especially now that some dresses are discounted by up to 50%. Here are my top picks. I struggled cutting down to 3 dresses, especially since some of them are available in different colours. 1. Silver Samantha Sequin Dress, £165. Nothing says party as much as sequin. Be daring, hit the dance floor and shine like a star (literally). 2. Aztec Drape Maxi Dress, currently on sale and is £ 144. For the most elegant of parties. Channel your Grecian goddess by adding gold bangles and putting your hair up. Best choice for pear shaped readers. 3. Spotlight Knit Cap Sleeve Dress, £115. Available in red, baby pink and mercury grey. 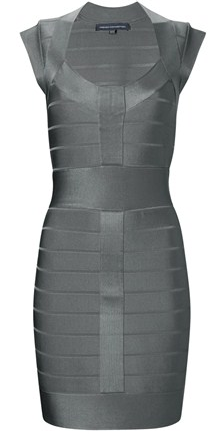 The shape and texture is inspired by Herve Leger dresses, but unlike many other copies, the quality here is outstanding. Try it on and see how it hides all your ‘problem areas’ and highlight all the curves! Possibly the best dress ever. Go online to http://www.frenchconnection.com and see the rest of collection for yourself. Come back and let me know what you are wearing this holiday season! Christmas is just around the corner and everyone is looking for a right pair of shoes to wear to the celebrations. 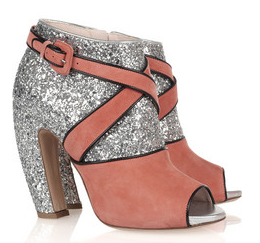 This season the shoe trend is perfect – look no further than Cinderella-inspired glitter pair. While the trend originated with Miu Miu and shoes like the Glitter and Suede Ankle Boots above (£555) there are various great options available on High Street. 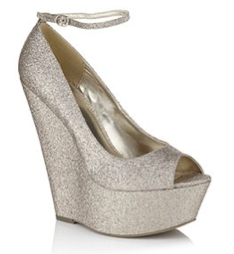 My favourite of which is the Carvela Grass Wedge (£150) that I will be definitely adding to my shoe closet. My advice would be to style the outfit down by wearing a single-colour dress, but do not be afraid to experiment with different textures and structures. After all you will be wearing that to a Christmas party and hence would like to stand out as much as possible. Just go for it – every girl dreams of being a Cinderella for a night! You are currently browsing entries tagged with christmas at MY FASHION WISH LIST.